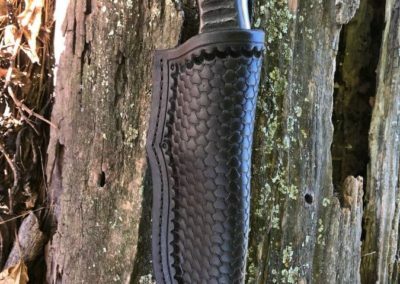 What is going on and coming up? 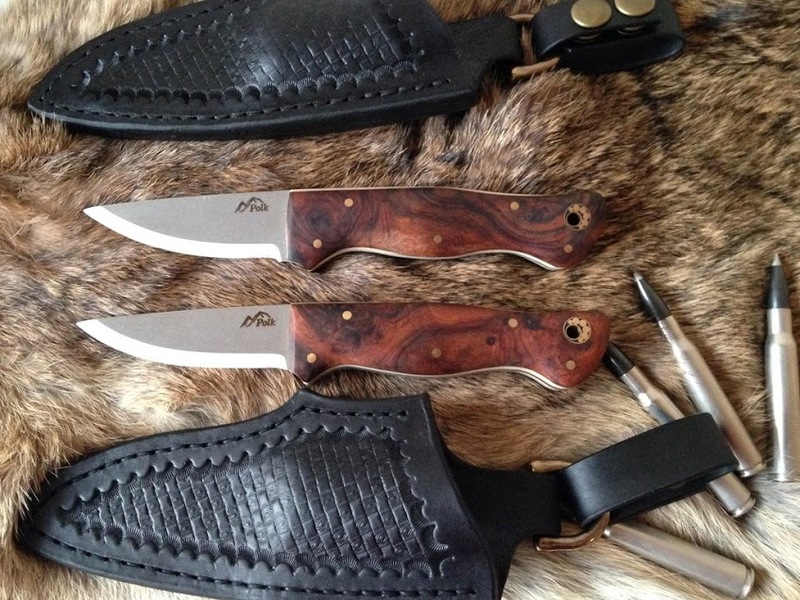 All of my sheaths are hand made and custom fit to each individual knife. 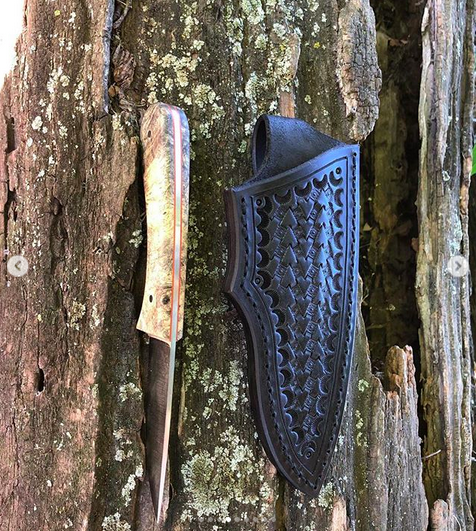 I work with both leather and Kydex. 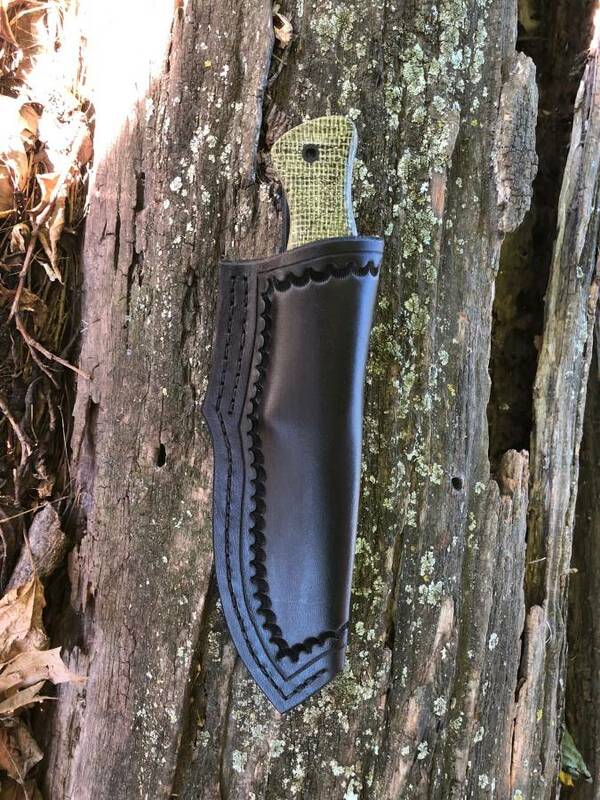 See my Kydex page for details and pricing regarding thermoplastic sheath work. 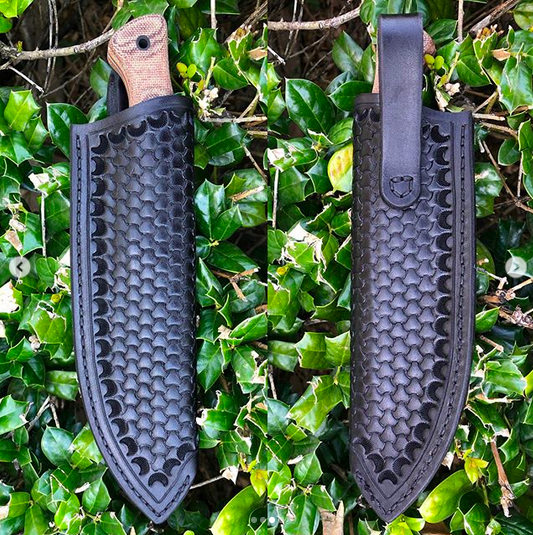 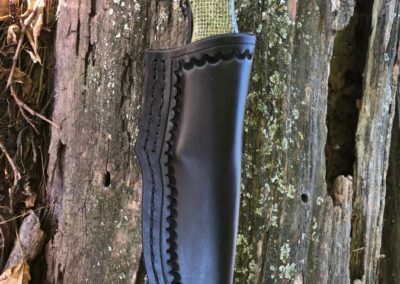 My leather sheaths are made from thick, top grade Harmon Oak vegetable tanned leather that I hand select at Springfield Leather and are stitched by hand using a saddle stitch for improved strength, durability, and serviceability. 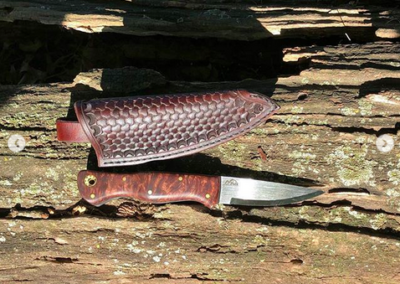 Harmon Oak leather is the highest quality tooling leather availible in the world. 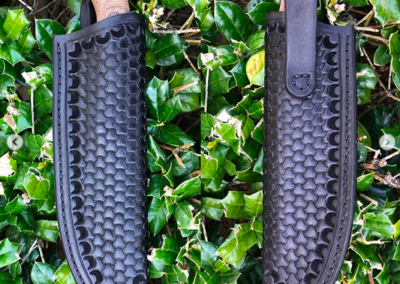 Their tanning processes take about 3 times longer than what imported vegetable tanned leather uses which can be sourced at places like Tandy, Hobby Lobby, etc. 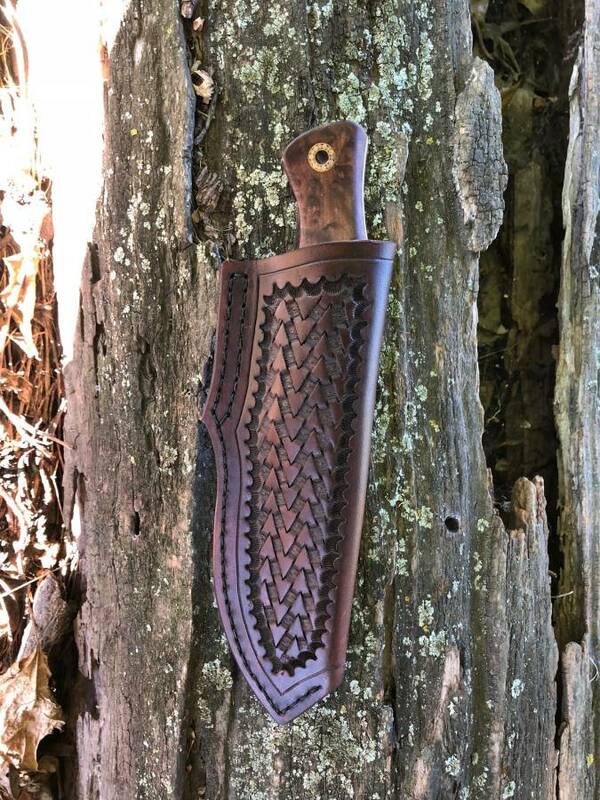 This results in their product being a little more expensive, but it results in leather that is consistently more dense at a given thickness so it is more tough and less prone to stretching, that takes dyes more evenly, and that takes stamping/tooling more cleanly and holds the sharpness of stamping better. 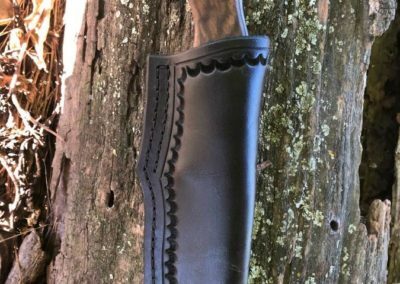 The end result is a higher quality sheath in all regards. 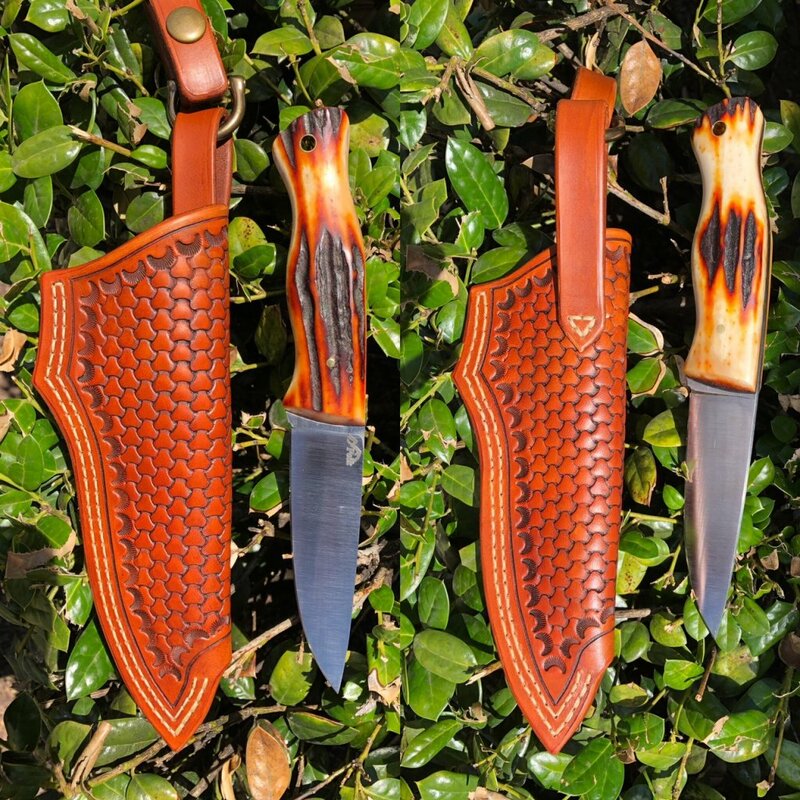 My leather sheaths are custom fit to each individual knife and are not simply generic pouches that happen to hold the blade. 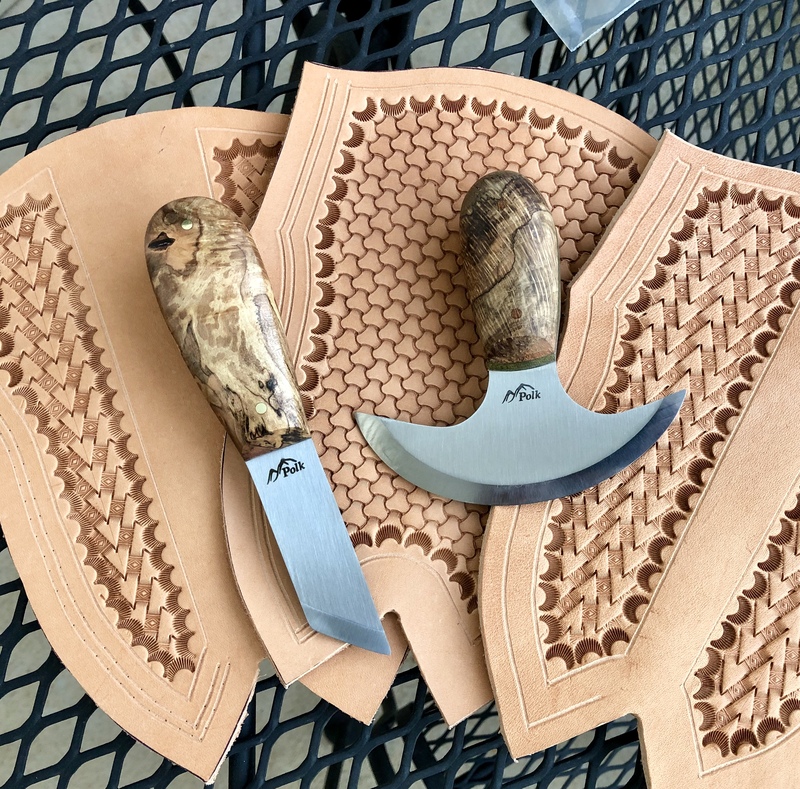 I offer a variety of tooling options, patterns, colors, stitching options, and belt loop options. 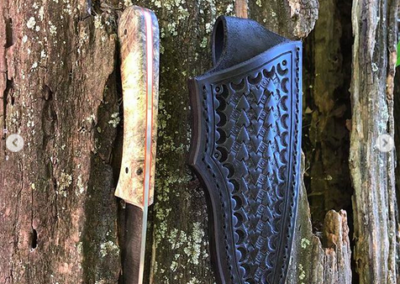 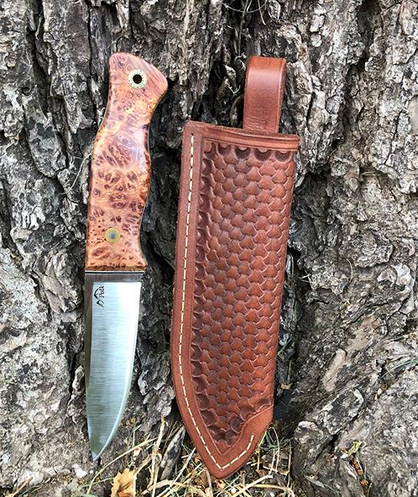 Properly made leather sheaths take time to complete and will increase the overall build time of your custom knife order but are worth the wait. 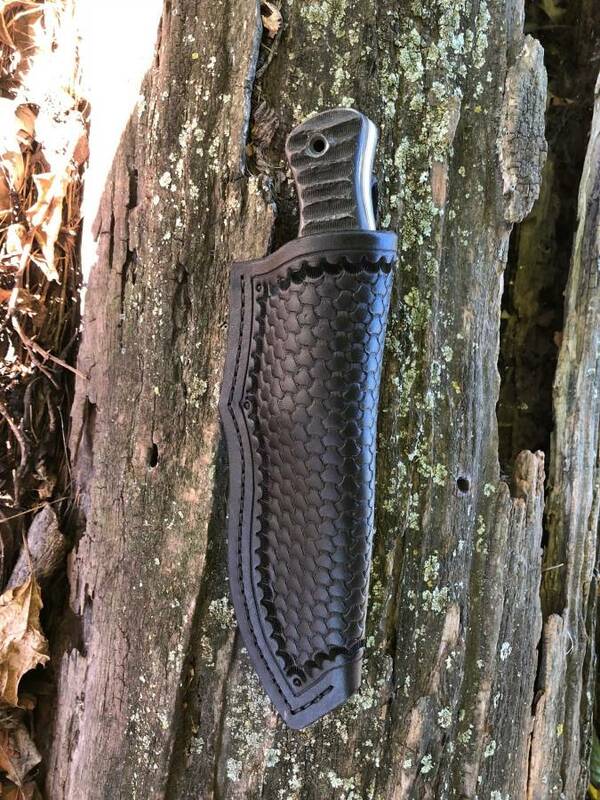 AEB-L steel at 61 HRC. 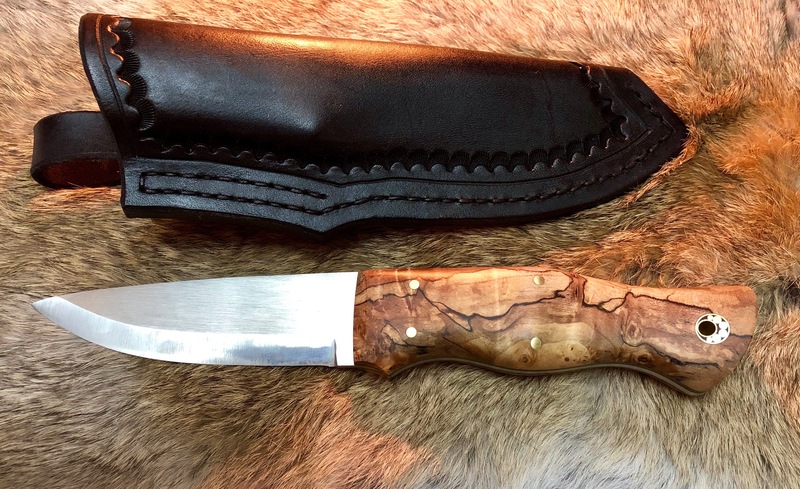 Stabilized reyed and spalted white oak over 1/8″ OD linen micarta liners and micarta pins are on the round knife. 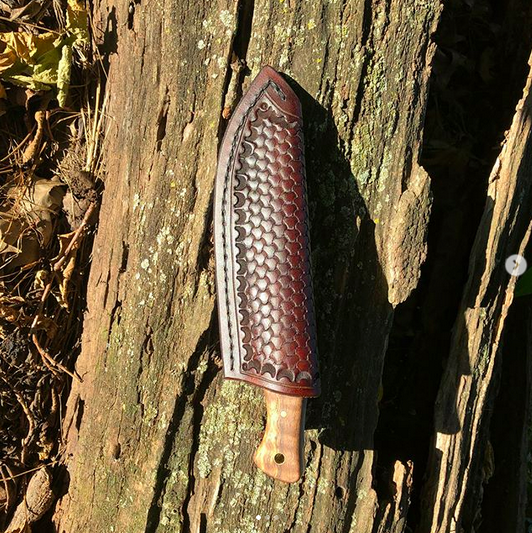 Stabilized curly and spalted maple with brass pins are on the chisel. 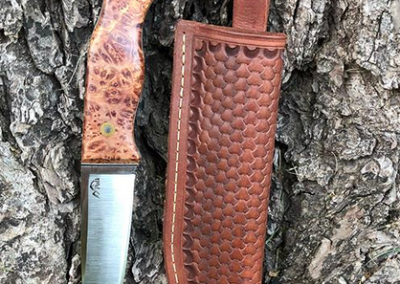 AEBL steel at 61 HRC and stabilized spalted and burled maple with mosaic lanyard tube and simple pouch sheath. 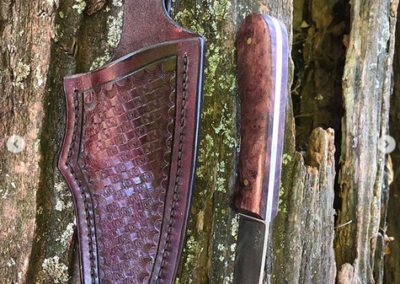 CPM 3V steel, Scandinavian grind, historic curly walnut scales from wood present at the Battle at Pea Ridge in the US Civil War, brass hardware, and tooled leather sheath. 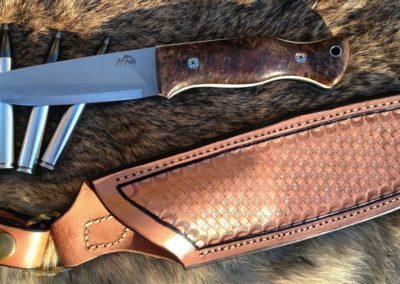 CPM 3V steel, flat ground, tan canvas micarta over orange liners, carbon fiber hardware, tooled leather and kydex sheaths. 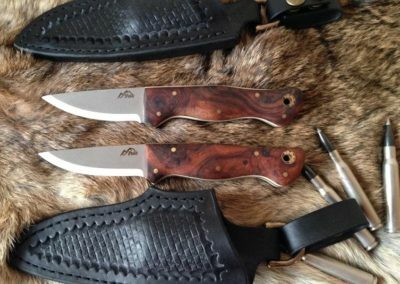 These are a matched father & son pair from my first batch of knives. 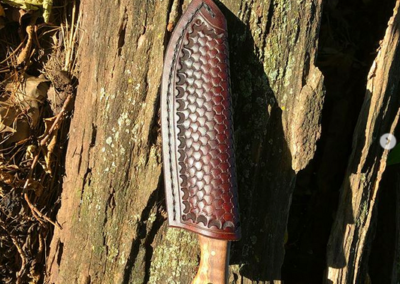 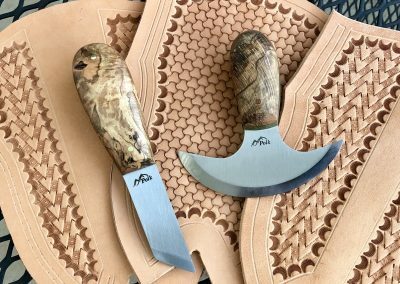 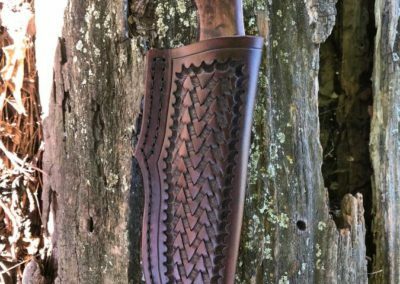 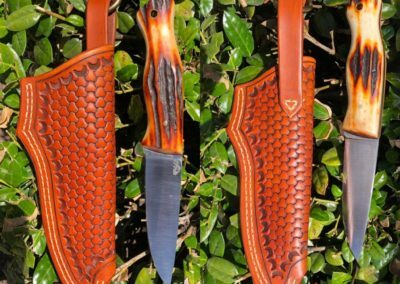 They are in 1/10″ Elmax steel with Arizona desert ironwood scales with a 5 pin design, mosaic lanyard tube, and tooled leather sheaths with removable dangler loops. 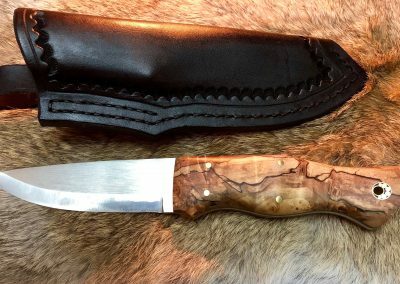 CPM 3V steel, stabilized rosewood burl, hunter green G10 liners, 5 pin design, mosaic lanyard tube and tooled leather sheath. 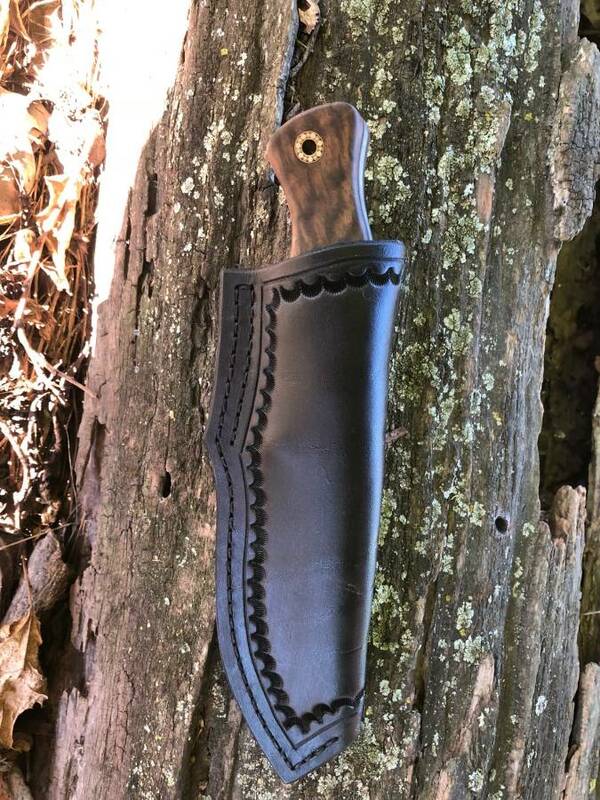 CPM 3V steel, stabilized redwood burl, white liners, brass pins, and tooled leather sheath with two tone dye and removable dangler loop. 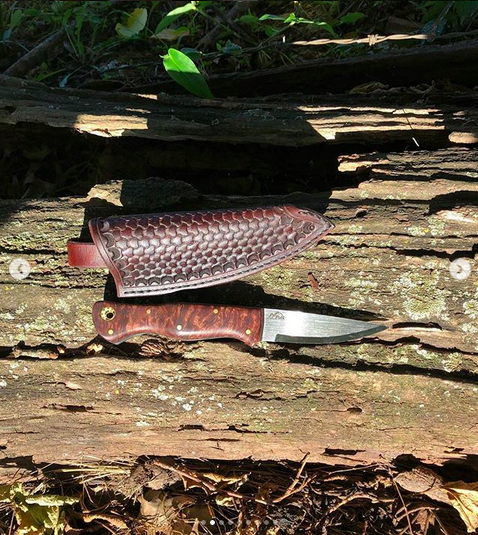 CPM 3V steel, stabilized buckeye burl scales over orange G10 liners with carbon fiber pins and tooled leather sheath. 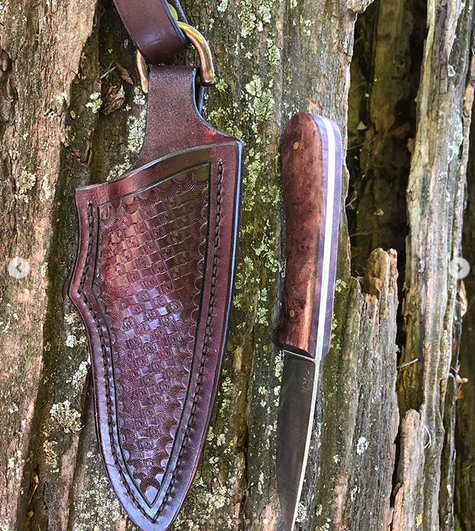 Bird & Trout based off of my Small Game Hunter in Elmax steel, stabilized historic curly walnut from The Battle at Pea Ridge in the US Civil War, and mosaic pins. 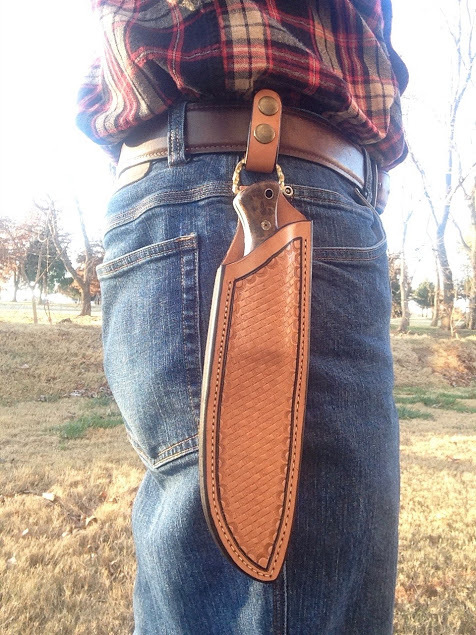 Simple pouch sheath with scalloped edge, border tooling, and double row stitching at the top. 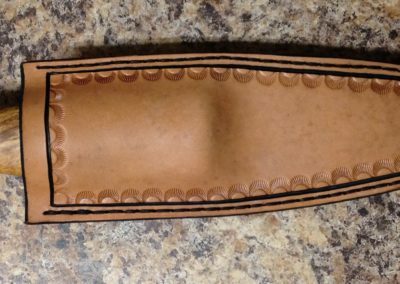 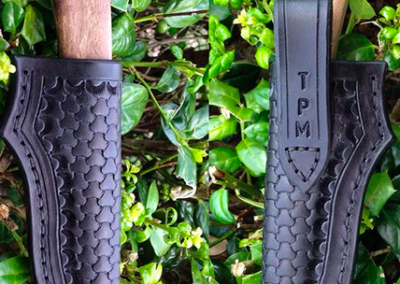 This is a simple black pouch sheath with border tooling and double row stitching at the top. 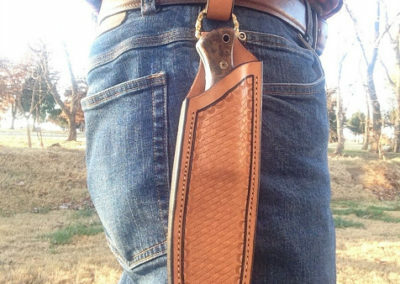 It’s clean and classy looking. 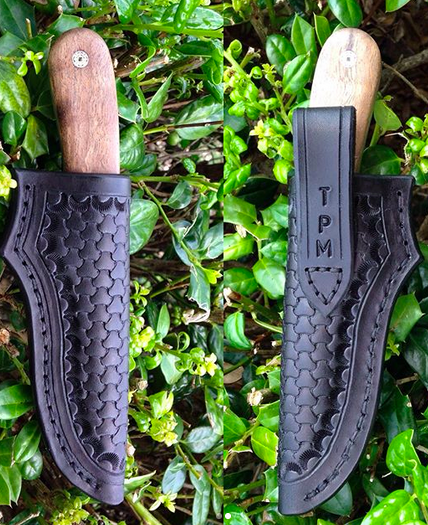 Color matched black sheath in A-Grade Harmon Oak vegetable tanned leather with a custom fit and full coverage tri-weave tooling.